An apparently healthy young woman riding the New York City subway suddenly collapses and dies of what appears to be an overwhelming case of pneumonia. Fearing a viral outbreak similar to the 1918 influenza pandemic, veteran medical examiner Jack Stapleton conducts an autopsy and is surprised to discover the victim was a recent heart transplant patient. Tests reveal that she was not taking immunosuppressant drugs while her body accepted the heart, which is unheard of, and Jack is shocked to learn that DNA tests on the donor heart match the victim exactly. As he presses further into the mystery, Jack discovers that a health care corporation with a great deal of money to invest in cardiology and organ transplantation is behind new advances in gene editing biotechnology that may be causing a number of mysterious deaths. 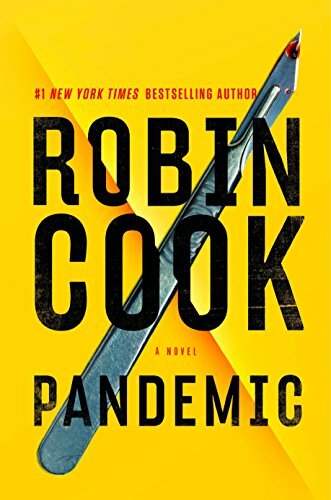 Pandemic is the latest installment of the ongoing medical thriller series by Robin Cook featuring Dr. Jack Stapleton and his wife/boss Dr. Laurie Montgomery. His past bestsellers include Coma (1977), Outbreak (1987), and Harmful Intent (1990). Pandemic is his 11th thriller featuring Jack Stapleton. Let’s not beat around the bush. Robin Cook fans who enjoy Jack Stapleton stories will no doubt be pleased with a new installment, but Pandemic is a perfect example of a manuscript produced under the name of a bestselling author that should never have seen the light of day. It’s a terrible novel—a revenue generator and very little else. The storyline seeps out like a slow-drip intravenous feed, taxing our patience to the limits. It takes 150 pages, for example, to identify the first victim, and despite the title, 48 hours and a total of 230 pages before a second—second—victim appears. Jack’s feverish imagination has skipped from a single occurrence to a pandemic, completely bypassing epidemic, simply because the circumstances of the woman’s death remind him of the 1918 flu crisis. Most of the early action consists of Jack cycling around the city in search of basic information he readily admits falls under the purview of other, better qualified, individuals. Police detectives, for example. We’re told repeatedly that he needs a diversion from his home life, particularly his daughter’s autism and the presence of his opinionated mother-in-law. His self-justification for meddling in previous cases in earlier novels was the loss of his first family. The more often these excuses are mentioned the more unrealistic they feel. Jack himself is a character who’s very difficult to like. His abrasive sarcasm and willful disregard for proper procedure, not to mention effective time management, would seem to be intended to channel Dr. Gregory House, but the guy’s personality is irritating to the point that it takes an act of will to continue reading the story. Other characters are equally dissatisfying. Wei Zhao, the septuagenarian Chinese billionaire behind the nefarious organ transplant dealings, is a stereotype with a twist: a fitness freak who idolizes Arnold Schwarzenegger and has a body to match. Jack’s dust-up with the old dude near the climax of the story is ludicrously amusing. As well, Jack’s wife Laurie functions mostly as an obstacle to his investigative fun and a source of stress. Street-smart Warren Wilson, with whom Jack plays pick-up basketball about every third chapter, is another cringe-worthy stereotype. Even worse is the dialogue. While performing the autopsy on their second victim, Jack’s weird assistant Vinnie remarks that she’s wearing “nice duds. She looks like she, too, had gotten dressed up for something.” Who talks like that? None of the words coming out of the mouths of Cook’s characters sound realistic in the slightest. But back to the plot. We haven’t yet mentioned the CRISPR/CAS9 gene editing biotechnology that serves as the hook for this story. While Cook is touted as having once again seized on a hot-button issue for his new bestseller, the fact is that CRISPR/CAS9 is treated as little more than window dressing, a term that gets tossed around a few times as a red flag to encourage Jack’s moral outrage and his reckless crusade for justice. Which brings us to the strangest part of the story. Apologies for the spoiler, but when the guy responsible for the retrovirus that causes the “mini-pandemic” admits his actions to Jack at the end and receives a hand-shake and a heart-felt attaboy from our intrepid hero, the reader should be forgiven for being confused about Cook’s moral direction in this novel. The guy investing money in pioneering genetic work without proper government oversight is Satan incarnate, while his son, who sabotaged his father’s work and killed a number of innocent people in the process, has a bright future ahead of him? Sorry, folks. Pandemic hits the bookshelves DOA, a poor excuse for a medical thriller that’s a waste of your time and money. Perhaps Robin Cook should give Jack Stapleton his last rites and consider a different approach and a different hero next time out.